Lil' Blog and More: Review and Giveaway: Joey Junior Purse Hanger ARV: $19.95 Ends 6/16 US Only. Review and Giveaway: Joey Junior Purse Hanger ARV: $19.95 Ends 6/16 US Only. 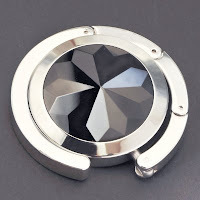 Thanks to Joey Junior for providing me with a free purse hanger to review. The Joey Junior Purse Hanger is so cute! The Joey Junior Purse Hanger is round and about the size of a half dollar. So, as you can imagine it is very easy to keep handy. For my review I received the Purple Passion Purse hanger and I love it! 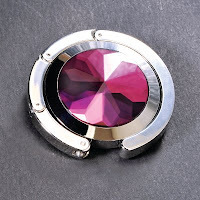 The Purple Passion Purse Hanger is really cute because it has that light purple and it looks like a giant jewel. I happen to think that purple is a more neutral color and it goes with most of my bags and clothes. So when I go out to eat I can pull it out and hang it right off the side and still look fashionable. - Non-slip pad keeps hanger in place. The benefits of a purse hanger are amazing, and I really think every woman should own one. Think about this, you pay $20.00 one time for a purse hanger VS. Replacing handbags constantly , having your bag getting stolen and losing all your money. Really, in the long run, it is so worth buying. I remember several years ago my Great Grandmother bought a purse hanger and she used it every day. No joke, the purse hanger was almost a necessity to her. If you are looking for a Purse Hanger then stop by and check out the different ones at Joey Junior. They have 5 different colors to choose from: Clear Crystal, Ruby Red, Blue Sapphire, Purple Passion and Black Diamond. Besides the Purple Passion, my next favorite would have to be the Black Diamon because it is so mysterious! Mandatory entry: Visit the Joey Junior website and tell me which purse hanger you like the most. My 1st would be the Purple Passion because ILOVE!!! the color purple, but the Blue Sapphire would be my 2nd because that's my birthstone. I entered the $100 American Express Giveaway. Entered the $100 American Express Gift Card giveaway. Entered the Cate & Levi Hand Puppet giveaway. Entered the Gourmet Gift Basket giveaway. Entered the Season's Puffs giveaway. Entered the Yanni Creation's Giveaway. I like the Blue Lagoon color the most. i follow on google frienc connect. I entered the $100 Gift Certificate Giveaway. I entered the YoYo Giveaway. i subscribe by email 2. All the colors are lovely but I the RUBY RED is irresistible! Entered the Seraphina Rose Etsy Shop giveaway. I like the Purple Passion the best. I entered the $100 gc giveaway. I entered the Seraphina Rose Etsy Shop gc giveaway. I like purple passion the best! I entered your delicate soles contest! Blue sapphire is my favorite color. Got to have it! !